"It is a truth universally acknowledged that a Fallen Woman"
of good family must, soon or late, descend to whoredom." ""Miss Sarah Tolerance refuses to follow the path of the Fallen Women who have gone before her. She's a straight shooter, with her pistol as well as her wit, and her mind is as sharp as the blade of her sword. Miss Tolerance is an Agent of Inquiry, a private investigator of sorts--the sole one of her kind in London, in this year of 1810 with mad King George III on the throne and Queen Charlotte acting as his Regent. Her aim was to trace lost trinkets, send wastrel husbands back to their wives, and occasionally provide protection to persons with more money than sense--but she is continually drawn into the plots of others. Her newest case poses a puzzle unlike any she has faced before: who killed the Chevalier d'Aubigny? The French emigre was beaten to death in his own bed, found by his retainers the next morning, all the doors and windows of the house sealed tight. The murder is a classic locked-room mystery, but Miss Tolerance knows she can find the key. As Miss Tolerance examines the situation and interviews witnesses and suspects, she realizes things are far more complicated than she originally suspected--for the Chevalier had more enemies than he had friends, and Miss Tolerance is hard pressed to find someone who didn't wish him dead. Her search for his killer takes her from the lowest brothels of the seedy London underworld, where men go to indulge their more aggressive desires, to the Royal Family and a Duke who must hide his perversions or risk the Throne. Welcome to Miss Tolerance's Regency London, where nothing is what it seems and the only way to serve justice is to follow conscience rather than law. Madeleine E. Robins is certified as an actor combatant in rapier, quarterstaff, broadsword, and hand-to-hand fighting, and was a member of a troupe of actors who perform Shakespeare scenes with combat for high schools and Renaissance festivals. Madeleine is a New Yorker by birth, training, and inclination, but recently relocated to San Francisco, where she now lives with her husband (Emmy Award-winning sound editor Danny Caccavo), and their two daughters. She authored the "New York Times" Notable Book "The Stone War," several Regency romances, and many short stories. 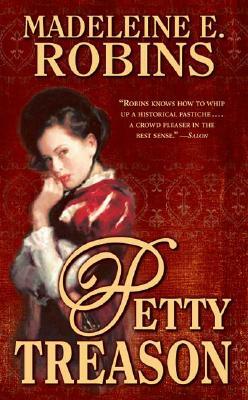 "Petty Treason" is her second novel to feature Miss Sarah Tolerance, Agent of Inquiry.